The CA Series is constructed from powder coated aluminum with an automatically locking safety glass viewing door. Microprocessor control allows the operator to set fuming cycle time and relative humidity levels between 50-80%. 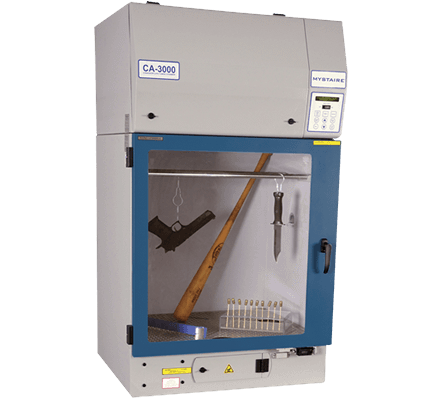 Using the CA Series is simple; position the non-porous evidence inside the chamber, add cyanoacrylate to the heating element and push the start button to begin fuming. The evidence technician can set fume cycle time and relative humidity via the simple-to-use microprocessor controller. During the fume and purge process the aluminum door automatically locks to prevent exposure to potentially harmful cyanoacrylate. Our exclusive, patented* filtration process ensures potentially hazardous cyanoacrylate fumes, that are generated during the fuming process, are effectively removed during the purge cycle. The cyanoacrylate-laden chamber air is not exhausted into the room like other brands of cyanoacrylate fuming chambers. The air is recirculated through a specially blended activated gas phase filtration bed until the cyanoacrylate fumes are removed. Our patented method for capturing potentially harmful cyanoacrylate fumes is more effective than the single-pass filtration method incorporated by other chamber designs. Cyanoacrylate is heated at ″A″ and released into the chamber where it is mixed with Humidity at ″B″. An internal circulation fan then mixes the cyanoacrylate vapor and humidity for even distribution around the articles of evidence at ″C″. At the end of the user-set development time, air is purged from ″C″ into the specially blended gas phase carbon filter at ″D″. Chamber air is then placed into the patented* recirculation loop at ″E″ that continues to filter the internal chamber air until it has been scrubbed free of residual cyanoacrylate fumes.